When Damon Hill crossed the finish line to win the 1996 Japanese Grand Prix he secured a unique piece of history for his family – the first father and son to have both won the Formula 1 World Championship. Graham Hill was the charismatic 1962 and 1968 champion and following in those footsteps was always going to be a daunting prospect for the reserved younger Hill. That said, and despite a late start to his motor racing career, Damon Hill successfully established himself at the top of the sport – culminating in that emotional day at Suzuka. Being Graham Hill’s son was no guarantee of an easy passage within motor racing and that career path seemed unlikely for the young Damon Hill. Fifteen years old when his father was killed in a light plane accident while returning from testing, that tragedy and subsequent insurance claims cost the family dearly. Damon Hill initially worked as a motorcycle courier and early competition steps were taken on two wheels, already sporting the same London Rowing Club colours that had adorned his father’s helmet. His first taste of car racing came in 1983 with a course at the famous Winfield Racing School and he switched to British Formula Ford 1600 two years later. Driving a Van Diemen RF85 for Manadient Racing, he managed the inevitable public scrutiny and hype with a calmness that would later characterise his demeanor as Britain’s leading Formula 1 driver. A race winner by the end of the season, Hill finished third in the Esso championship and was fifth in the senior RAC series before coming third in the end-of-season Festival at Brands Hatch. He signed for the crack West Surrey Racing Formula 3 team in 1986 but team-mate-to-be Bertrand Fabi was killed while testing at Goodwood before the season. WSR withdrew from the British championship following Fabi’s death so Hill raced Murray Taylor’s Ralt RT30-Volkswagen instead. It was May before he finished in the points but Hill improved thereafter – finishing second at Snetterton and ninth in the final standings. Hill landed a fully funded Cellnet drive for the 1987 season and showed progress in the Intersport-run Ralt RT31-Toyota. On pole position for round two at Brands Hatch, his form noticeably improved once the talented Martin Donnelly joined the team from mid-season. Hill scored breakthrough victories on the championship’s overseas excursions to Zandvoort and Spa-Francorchamps and was a competitive fifth overall. That earned another season with the team in the 1988 British F3 Championship with Donnelly his team-mate once more. The Irishman missed the last six races of the season to race in Formula 3000 and Hill had usurped the Irishman for third in the standings by the end of the campaign. Another two F3 wins that year included beating Gary Brabham in the British GP support race although more had been expected from his third season in the category. He also started the last two F3000 races of the year – his GA Motorsport Lola T88/50-Cosworth finishing eighth at Dijon-Prenois. Without a single-seater opportunity at the start of 1989, he drove a Richard Lloyd Racing Porsche 962GTi at Le Mans, retiring on his only appearance in the famous 24-hour race. When his next FIA F3000 chance arose a month later, it was replacing Ukyo Katayama behind the wheel of the solitary, but uncompetitive, Footwork MC041-Mugen. Qualifying for each race entered was success in itself but 14th was Hill’s best finish in six outings. Already in his 30th year, Hill joined Middlebridge Racing for the 1990 FIA F3000 Championship and proved to be a revelation. He qualified the team’s Lola T90/50-Cosworth on pole position for successive races at Monza, Enna-Pergusa and Hockenheim only for poor reliability to deny his victory chances. He would have won at Brands Hatch but for a pitstop and second that day was his only meaningful finish of the season. Bolstered by displays of race-winning pace, Hill moved to Eddie Jordan’s Barclay cigarettes-backed outfit and signed as Williams test driver in 1991. Unfortunately his F3000 campaign was handicapped by his Lola T91/50-Cosworth being no match for the rival Reynard teams. A couple of fourth-place finishes were achieved before he switched to a Reynard 91D-Cosworth for the season finale at Nogaro which he finished in third position. That cemented seventh overall in Hill’s third and final F3000 season. Hill continued as Williams test driver in 1992, racking up the miles as team leader Nigel Mansell marched towards that year’s world title. Alongside those duties, he joined Brabham at the Spanish GP but the team was in terminal decline and its Judd-powered BT60B was not fit for purpose. Hill qualified for just two of his eight GPs in the car – finishing 16th on his debut at Silverstone and 11th on the day that Nigel Mansell was crowned world champion in Hungary. The Hungarian GP proved to be Brabham’s last appearance before the once-great team folded. That sorry episode had not dented his reputation within Williams however. Despite having started just two GPs so far, Hill was promoted into the Williams-Renault race team as Alain Prost’s team-mate for the 1993 World Championship. The Williams FW15C-Renault was the best car in the field and Hill recovered from a couple of errors during the opening race at Kyalami to push his illustrious colleague more and more as the season progressed. Certain victories at Silverstone and Hockenheim were lost to mechanical failure and a puncture before Hill scored successive wins in Hungary, Belgium and Italy. It was almost enough to make the British public forget erstwhile hero Mansell. Hill was third in the World Championship and proved himself worthy of his place in the team. Prost won the 1993 title but headed for retirement rather than remain with Williams as team-mate to the incoming Ayrton Senna in 1994. Hill was seen as the perfect complement to the mercurial Brazilian and it was left to the Englishman to lead the team following Senna’s tragic death at Imola. Victory in Spain was followed by a popular home success at Silverstone (a race Graham never won) on the day that rival Michael Schumacher’s Benetton was disqualified. Three wins in a row followed and Hill’s standout performance in the Japanese rain ensured the title would be decided at the final race in Australia. Hill was making his move for the lead in Adelaide, a pass that would have won the 1994 World Championship when Schumacher crashed into him to eliminate both cars and clinch the title by a single point. It was a bitter and controversial defeat that was accepted, in public at least, with admirable dignity. The 1995 season again saw Schumacher and Hill at the front of the field as their rivalry grew increasingly tense. That came to a head during the British GP when they collided while disputing the lead and further contact followed in Belgium and Italy. Hill was given a suspended ban for his part in the Monza incident as Bernie Ecclestone criticised their driving standards. Hill won four times during 1995 but eventually finished a distant runner-up behind the German. Schumacher accepted a lucrative contract to help rebuild Ferrari so Hill faced a challenge from within Williams for the 1996 title. He was joined by reigning Champ Car champion Jacques Villeneuve and the precocious French-Canadian almost won his F1 debut in Australia. Villeneuve’s FW18 suffered an oil leak during the closing stages that allowed Hill through to score the first of eight wins that year. He was 15 points ahead of Villeneuve when he arrived at Hockenheim to reports that he was not going to be retained by Williams in 1997. He won that weekend and eventually withstood Villeneuve’s increasing challenge to clinch the 1996 World Championship with victory at the final round. Unceremoniously dumped at the moment of his greatest success, Hill was left with no top F1 drives available for the coming season. Tom Walkinshaw persuaded him that Yamaha engines, Bridgestone tyres and undisputed number one status at Arrows was the best option for his title defence. It was the British GP before the car held together long enough for Hill to score a point but he almost pulled off one of the most surprising F1 victories in history later that summer. On a rare day when Bridgestone rubber was superior to its counterpart from Goodyear, Hill led the Hungarian GP with ease before slowing dramatically during the closing stages. Hampered by gearbox problems, he was passed by Villeneuve on the last lap and limped home in second position – Arrows’ best F1 finish but a famous victory lost. Hill moved to Jordan Grand Prix in 1998 when well rewarded and in the hope of returning to winning ways. Again it seemed to be a lost year as Hill floundered before fourth-place finishes in Germany and Hungary represented a welcome upturn in form. The team then benefitted from a pile-up at the start of the Belgian GP and Michael Schumacher running into the back of Coulthard’s McLaren in the heavy rain. That allowed Hill to lead team-mate Ralf Schumacher in a famous Jordan 1-2 – a breakthrough victory for the independent team. Sixth in the championship that year, Hill remained with Jordan in 1999 for what proved to be his final season before retirement. He finished fourth at Imola but was generally unable to match new team-mate Heinz-Harald Frentzen (who had replaced him at Williams) during his lacklustre final year behind the wheel. Hill’s victory in the 1996 World Championship assured his place in British motor racing history and he assumed the role of President of the British Racing Drivers’ Club from 2006 to 2011. He was key during that period in negotiating with Formula One Management to secure the future of the British GP. 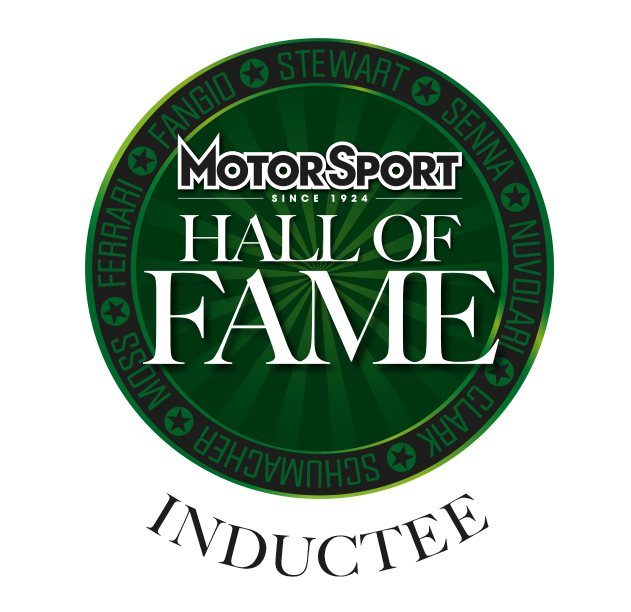 Hill now appears alongside FF1600 and F1 contemporary Johnny Herbert as an F1 analyst for Sky Television.